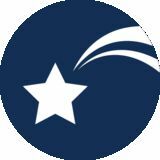 Kofax Express POWERFUL INFORMATION CAPTURE Kofax Express™ enables small and medium sized companies to digitize and automate document capture and archiving by converting stacks of paper into electronic actionable and managed business content. This powerful workstation-based package makes it easy for anyone to quickly scan, index and export documents. Easy for beginners and flexible for experts, Kofax Express automates the process of indexing and tagging documents, reducing the time and complexity to archive information. Data captured by Kofax Express can be submitted into more than 100 different back end systems including Microsoft® SharePoint®, ECM, BPM, archives and systems of record. SCALABLE AND EXTENDABLE Kofax Express supports the ability to add additional workstations for scanning, indexing, and export. This flexibility provides the ability to deploy additional processing power and stations to improve the throughput of their system. INTUITIVE AND USER FRIENDLY INTERFACE The software features the same familiar interface as Microsoft® Office applications. Operators can execute commands with a single mouse click for faster adoption and greater productivity. HIGHEST IMAGE QUALITY Innovative SmoothView™ technology enables users to easily manipulate multiple document images. Users can find, replace, gather, zoom, divide, rotate, swap, order and place document images—in ways not possible with paper. 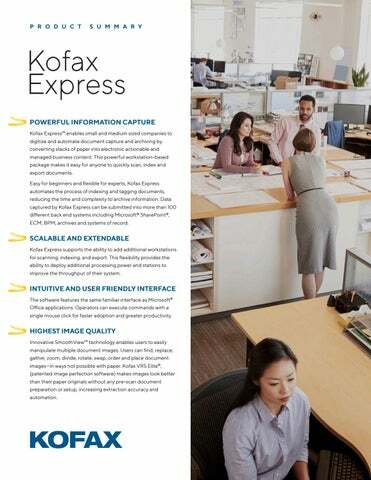 Kofax VRS Elite®, (patented image perfection software) makes images look better than their paper originals without any pre-scan document preparation or setup, increasing extraction accuracy and automation. INTEGRATION WITH SHAREPOINT AND OTHER SYSTEMS Tight integration with Microsoft SharePoint enables Kofax Express to index, classify and deliver documents and data into SharePoint for easy and fast retrieval. Kofax Express also supports all Kofax Capture export connectors for out-of-the-box compatibility with popular ECM and ERP systems. An export API is also available for custom or advanced export use cases. quicker adoption and greater productivity gain. It also automatically extracts index field data. Users can train the program to locate the key index information in a document and it remembers that location and extracts the data from future documents, reducing manual data entry effort. downstream processing, lower storage requirements, and improved efficiency. foreground. It is also useful for large standard PDF or TIFF exports. sources, or validating data entered into a field. FLEXIBLE DOCUMENT SEPARATION Kofax Express can separate groups of documents automatically, eliminating the need to scan documents one at a time. Just fill the auto document feeder to its capacity and Kofax Express divides the batch into individual document groups automatically based on patch codes, bar codes or inserted blank pages. Kofax Express process documents faster than ever before by keeping the scanner in continuous operation while it handles the separation. POST-SCAN PROCESSING WITH VRS CORRECTIONS If Kofax Express encounters a poor quality document it can’t convert into a legible image, it doesn’t shut down the scanner and wait for a fix. Instead, its VRS Corrections feature reserves the image for later inspection and correction by the operator without needing to rescan the document. Kofax Express retains enough information from the original that the operator can manually correct the image after completion, enabling the scanner to run without pause. VISUAL UNDO HISTORY Everyone relies on the Undo button. But undo enough steps and it’s easy to lose track of where you’ve come from, what was undone and what can be redone safely. Kofax Express includes a Visual Undo History feature that shows the sequence of processes that were done—or undone—on any document image. kofax.com © 2019 Kofax. Kofax and the Kofax logo are trademarks of Kofax, registered in the United States and/or other countries. All other trademarks are the property of their respective owners.